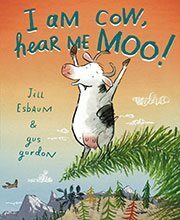 In I Am Cow, Hear Me MOO!, Jill Esbaum has writ­ten a clever pic­ture book with rhyme that works con­sis­tent­ly and is a joy to read out loud. She helps us under­stand one very impor­tant thing about brav­ery: what looks like brav­ery on the out­side can cov­er up a quiv­er­ing bowl of scared milk pud­ding on the inside. By act­ing brave, the most timid cow can find courage, amaze friends, and explore adven­tures undreamed. 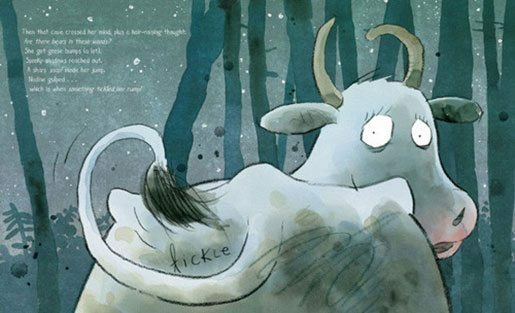 If every­thing works well, said cow might even feel brave now and then. Good for gig­gles, Ms. Esbaum’s poet­ry includes impres­sive vocab­u­lary: galumphed, sashayed, cran­ny, dead­fall. In the con­fines of 32 pages, we find fore­shad­ow­ing, irony, and a shift in mood from light­heart­ed­ness to (cow-fla­vored) ter­ror and back again. That takes skill. Gus Gordon’s illus­tra­tions are adept, being at once com­i­cal and por­tray­ing the shift­ing emo­tions of our hero, Nadine. With a com­bi­na­tion of pen­cil and cray­on, lay­ered col­lage, and water­col­or mov­ing the book from bright day­light to scary night, the trees in his for­est are among the most beau­ti­ful I’ve seen in books. His facial expres­sions are wor­thy of an Oscar. His use of botan­i­cal draw­ings inte­grates so well into the illus­tra­tions that Nadine’s intim­i­dat­ing for­est also feels wel­com­ing. It’s the con­tra­dic­tion about brav­ery (the out­side appear­ance, the inte­ri­or pud­ding) that is so appeal­ing here. Many a read­er will rec­og­nize them­selves in Nadine’s sto­ry. 2 Responses to I Am Cow, Hear Me MOO!